This year’s home is well over 5,000 square feet. A signature feature of the library/sitting room is the peninsula fireplace. 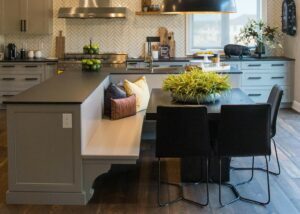 The kitchen was reconfigured for an L-shaped island and banquette seating. The spacious media room gets a pop of red. The dining room is the only formal room in the house. 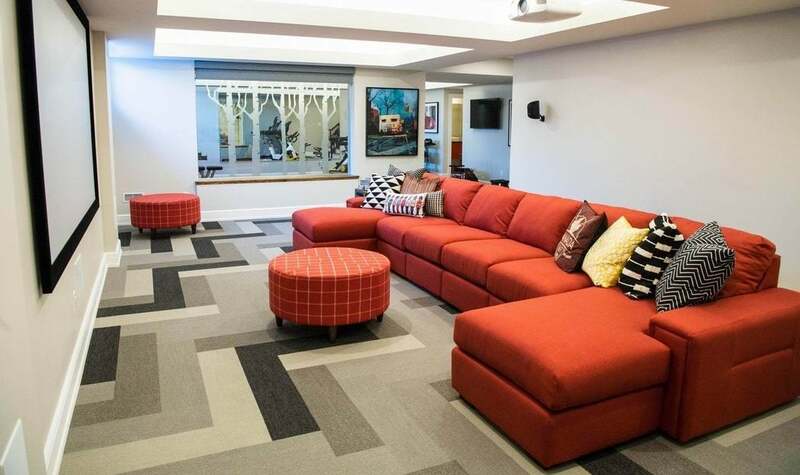 The mid-level family room aims to encourage connection and conversation. The girl’s room is an ode to Canadian cities, reflected in the cityscape wallpaper by the bubble chair. Originally a 4th bedroom, the den is meant for all family members. 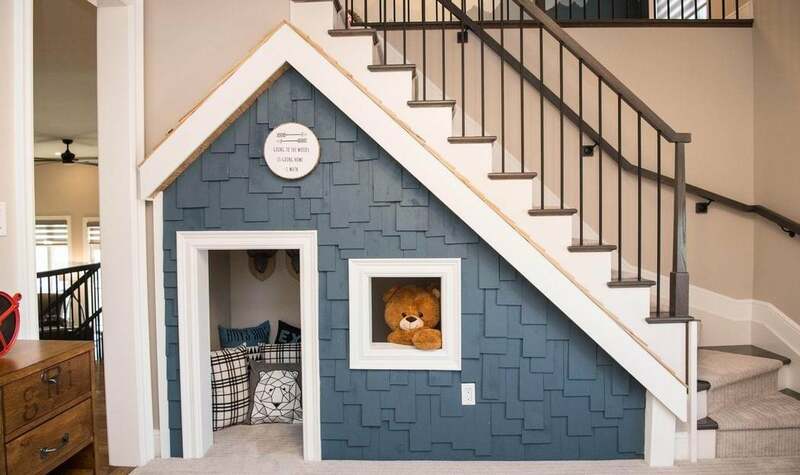 The boy’s room is about the outdoors and fun, with its own sleeping loft. The master suite combines rustic with a bit of glam. Every year the CHEO Dream Home offers a great big “what if.” What if you actually won it? Would you live in it? Could you live in it? 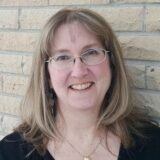 Sure, it’s big, well over 5,000 square feet, but designer Donna Correy of KISS Design Group, who has overseen the look of the home just about every year it’s been done in the past 25+ years, strives to make it a dream-inspiring home that is still immensely livable. And this year is no different. What is different though is the team that Correy and design partner Tracey Woodman put together to help create the look, because Correy insists – even though she’s said it before – this is her final year running the show. 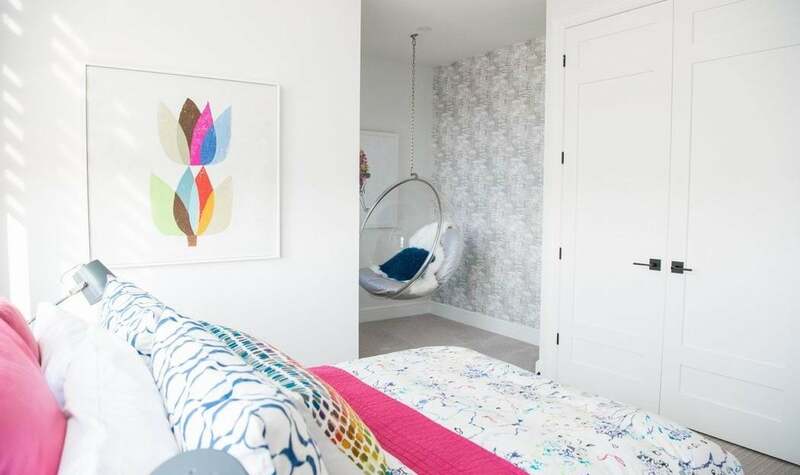 With that in mind, Sarah Kidder of Sarah Kidder Design and Krista Jadowski of Krista Jadowski Designs were invited to collaborate on the always-popular grand prize jewel of the Dream of a Lifetime Lottery, which is a fundraiser for the CHEO Foundation. If this is indeed KISS Design’s swan song with the dream home, Correy and Woodman are going out with a bang. Following a request from Minto Communities, which has supplied the home at a reduced cost almost every year the lottery has been held, the design team captured a sophisticated Canadiana theme to mark our country’s 150th birthday this year. 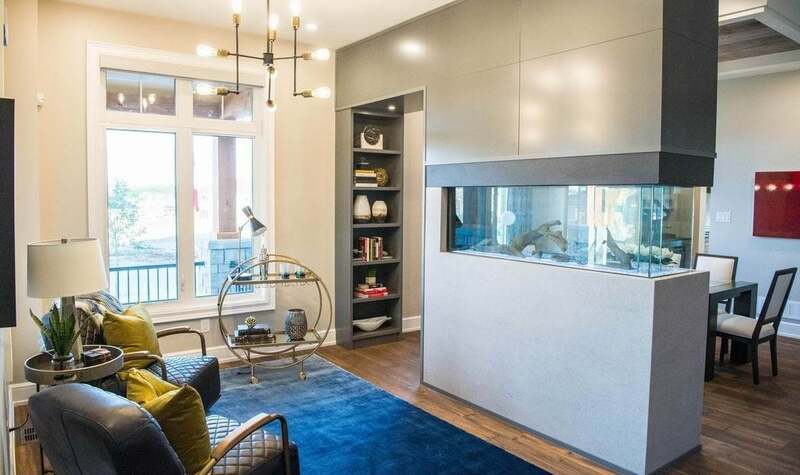 But once they figured out how to best introduce those historical or typically Canadian elements elegantly, they knew the overall look would work. The “celebrating Canada” theme began with the floor plan, one Minto calls – appropriately – the Red Maple. It’s based on an existing plan from the builder’s Toronto lineup called the Wimbledon, although there are several changes to make it more in keeping with a dream home. 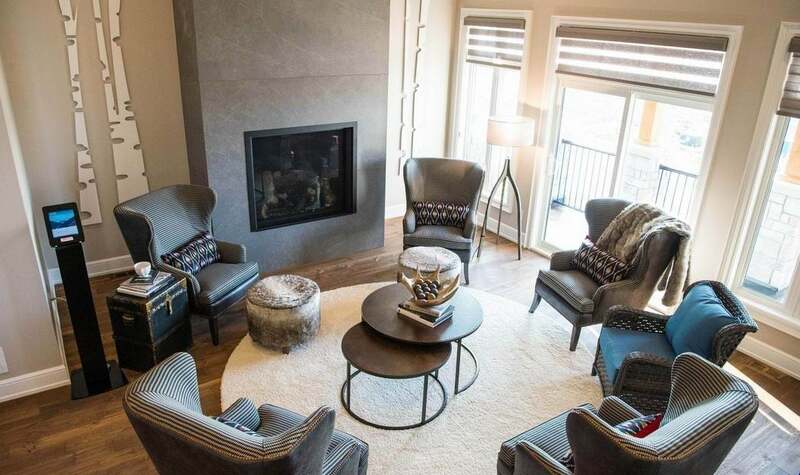 The 5,392-square-foot home (the largest yet and more than 1,000 square feet larger than last year’s home) comes with a three-car garage, four bedrooms (one has been made into a den), 4½ baths, 10-foot main-floor ceilings and three fireplaces. Built in Minto’s Mahogany community in Manotick, it makes up the bulk of the $1.79-million grand prize. Correy and the team aimed for an urban farmhouse or loft style, and wanted it to feel like it had a bit of history. That history is reflected in things like the flooring, made from century-old logs pulled from the Ottawa River, courtesy of Log’s End, or a conscious decision to pull colours for the home from the iconic Hudson’s Bay blanket, like the red sectional in the media room, the jazzy yellow stove in the kitchen and even the retro white Malm fireplace in the family room. There are also obvious touches such as the barn board accents throughout, the live-edge counter in the main bathroom, and the Douglas fir beams and posts that frame the porch and balcony. And there’s the stone façade, reminiscent of pioneer farmhouses. Then there are more subtle design decisions, like choosing matte finishes wherever possible to “keep everything much more natural-oriented,” Correy says. But this is by no means a traditional home. There are plenty of modern elements to make it appeal to today’s families, combined with nods to our industrial past. Minto first offered this type of layout in one of its models at Arcadia in Kanata a couple of years ago. When it proved to be quite popular, that prompted them to consider another model with a mid-level family room. 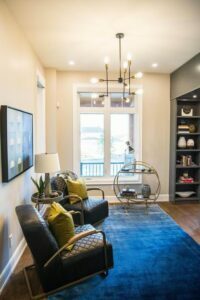 While Minto is not the only one exploring different types of family space, having a mid-level family room show up in a dream home for the first time suggests more alternate forms of family living space is on the horizon. Multi-use: Another big trend is more open spaces that have multi-uses, like the first room that you enter in the home. It’s called the library, although not like a library of days past. It could just as easily be an office space or a music room, or an intimate entertaining space, great for having a glass of wine with your best friend. Banquette seating: This is an older, more traditional look, but it’s coming back. Used effectively in the kitchen and framed by an unexpected L-shaped island, it’s an efficient use of space, can be a great storage area (if designed for storage), and makes a perfect spot to curl up with a good book. Counter culture: The countertop used in this year’s kitchen speaks to the continuing shift away from granite. It looks like quartz, which is today’s most popular choice, but it’s actually a porcelain sheet. This type of counter is 30-per-cent stronger than granite, doesn’t react to heat, and you won’t stain or chip it. Well-established in Europe for some time, watch for porcelain counters to gain popularity here. 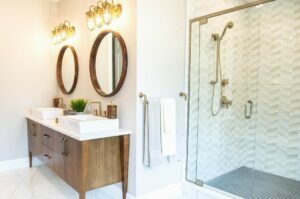 Golden rule: Having fixtures in gold is not an up-and-coming trend, but it’s certainly current and will continue to be popular. The faucets in the ensuite shower are a great example of using gold effectively. 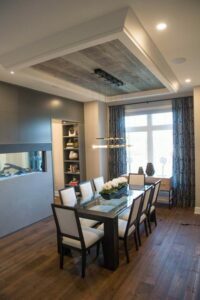 Wowing with wood: While wood treatments have also been trending for some time, look for them to show up in unexpected places, like the barn board on the dining room ceiling. 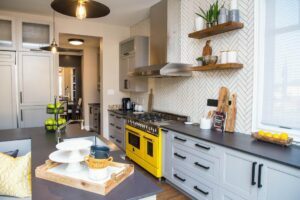 Tile tricks: “Every tile we picked was something that wasn’t even in the showroom yet,” Correy says of the tile choices, all of which came from Euro Tile & Stone. 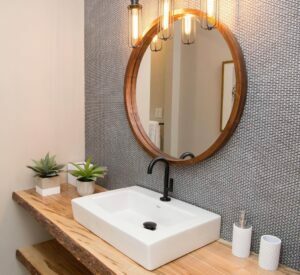 One of her favourites is the mini brick mosaic used in the main bathroom, a tiny version of the more traditional brick used as an accent wall in the den next door. Working on the project was a “whirlwind of delightfulness” for Jadowski and “awesome” for Kidder, both of whom would sign on to do it again. “In my opinion this is the most prestigious thing in the design industry to be involved in,” Kidder adds. The home is one of more than 5,000 prizes that can be won. Tickets are $100 each or 3 for $250 and you can view the home until Dec. 8. Get details here.